In February, Battle Rattle pitched in and helped Staff Sgt. Matthew Hansen win a contest that named a NASCAR race in honor him and his late twin brother. It’s time to play catch-up with that story. 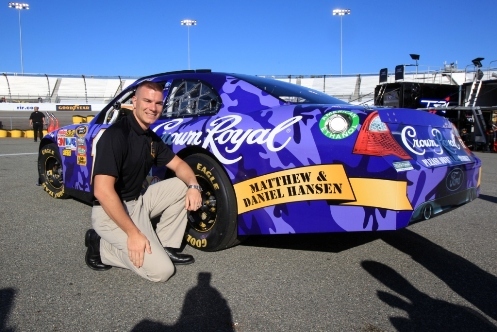 The Matthew and Daniel Hansen 400 was held Saturday in Richmond, Va., bringing attention to the ultimate sacrifice made by Sgt. Daniel Hansen, who was killed two years ago in Farah province, Afghanistan, when his foot patrol was hit by an improvised explosive device. He was posthumously promoted to staff sergeant. In all likelihood, you know a family member, close friend, or acquaintance that has traveled overseas to protect our nation. You may even know someone who has given the ultimate sacrifice. But on Saturday, the number of men and women who were represented was just too much. I honestly didn’t know if I was going to even be able to speak during our interview with Matthew Hansen and his wife. The emotions that were coarsing through my mind and heart were just out of control. I legitimately had to walk off by myself and collect my thoughts in order to finish out the afternoon. Later, when [country singer]Rodney Atkins pulled Matthew and his wife on stage to sing a song about triumphing over hardships, the tears came rushing back. I watched as Mr. and Mrs. Hansen danced together on stage, celebrating and commemorating his brother Daniel, who valiantly died in action overseas. I saw Marines in the crowd who had looked on stoically all night finally show a few glimpses of emotion. Well played. Well played, indeed. Thank you for sharing this story, God bless our soldiers. For the 4th of July I had me a glass of Crown wearing my Crown Royal Hat enjoying my independence.